A UNITY MINISTER DECIDES IT’S TIME TO HAVE THE TALK. Rev. Sandra Campbell was nervous. Her throat was dry as she sat in a small circle with congregants from Unity Temple on the Plaza in Kansas City, Missouri, for their first Courageous Conversations meeting. Campbell, an associate minister, didn’t know where this venture would go or how the participants could even get into the difficult discussions about personal and societal prejudices regarding race, religion, sexuality, class, and more. She didn’t know what the talks would uncover. She just knew she felt called to do this. The seven group members of diverse ages and ethnicities introduced themselves and shared information about their backgrounds and their current lives. Then Campbell used an exercise from the “Diversity in the Workplace” class she’d taught at Webster University’s Kansas City campus. She asked the group to identify politically correct names for a variety of peoples, including African Americans, Asian Americans, Caucasians, Jews, Latinos, LGBTQ, and others. The silence thickened. Someone coughed. “Now, think about who you know personally,” Campbell continued. “Do you know African Americans, Caucasians, Latinos, lesbians? When you see them, do you see the labels around the kitchen table or do you just see the individual?” The tension eased as the group talked about their friends and how much they had learned from being around people who were different. At the end of the two-hour session, everyone hugged. Campbell breathed a sigh of relief: She had wanted to build an environment where people would feel safe and invited to speak. They were on their way. nightclub, where a gunman murdered 49 people and wounded 58 more at a popular gay bar and dance club. She returned home with a heavy heart, haunted by a recurring question: What is ours to do? Campbell voiced her concerns at a Sunday lesson, asking, “Do we just pray and meditate, talk and agonize, and go back to business as usual while others are left to pick up the pieces?” Instead, Campbell saw the tragedy as an opportunity to lift up those who were hurting. Still, the question What is ours to do? stayed with her. Several Sundays later, after a black gunman killed five white Dallas police officers at what had until then been a peaceful protest, she decided to ask the question and invite comments during her Sunday lesson. Several people came up to her afterward and agreed that something needed to be done for the congregation to be more inclusive and engage the community on issues like racism, sexism, homophobia, Islamophobia, and so on. “If they answered, ‘Through prayer and meditation, I connect with God,’ I asked them how they show that,” she says. Campbell also asked participants, “How open can we be? Are we willing to share our truths honestly and with kindness? How do we shift to thinking that we are all children of one God?” The conversations helped people identify their strengths and challenges. Each person was affected by their circumstances growing up and brought with them stereotypes and prejudices. Tolson appreciates the openness of the group because people express different opinions but do not get into arguments. “This openness means we can change how we perceive ourselves, each other, and the world,” she explains, “and that can bring us all closer together.” Everyone in the group has benefited. “I didn’t have my voice until I joined this group,” one member who asked to remain anonymous said. “People would say disparaging things at work and I did not speak up. I simply went home feeling sad and discouraged.” Joining the group helped her open up and speak in a caring way. film 13th, which explores the relationship between race, justice, and mass incarceration in the United States. They visited interfaith organizations and got to know a wider swath of people. People reached out to Campbell to learn even more. She spoke with other African-American Unity ministers, including many who felt that there had been racial disparity in Unity during the 1960s and 1970s and that African Americans hadn’t been honored for their contributions. of African-American ministers, which was shown at the 2016 Unity People’s Convention. present a Courageous Conversations workshop at the 2017 Unity People’s Convention. Before an audience of about 70 people, Campbell described her group and their vision and showed the 2013 documentary White Like Me: Reflections on Race From a Privileged Son, with activist Tim Wise. After the film, the conversation burst wide open. Campbell was also a featured speaker at the Unity People’s Convention in June 2018. 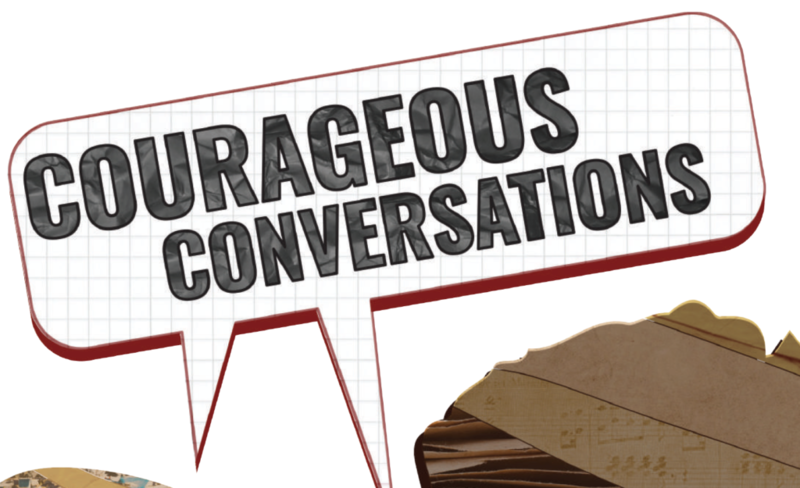 From a small core group, the Courageous Conversations concept is slowly spreading. And in the meantime, the original group has expanded and continues to meet, ensuring that their own courageous conversations keep going. • Set guidelines for the discussion, such as no interrupting, no blaming, no criticism. Invite people to listen quietly and respectfully before speaking. Make sure that everyone gets to express themselves. • Consider bringing an evocative film or reading to open the discussion. • Breathe first. This helps you center and release emotional attachment.